This new document, which I spoke about briefly on the previous episode of the Park Stop Podcast, appears to be one of the last pages of a handout given during the town hall meeting. 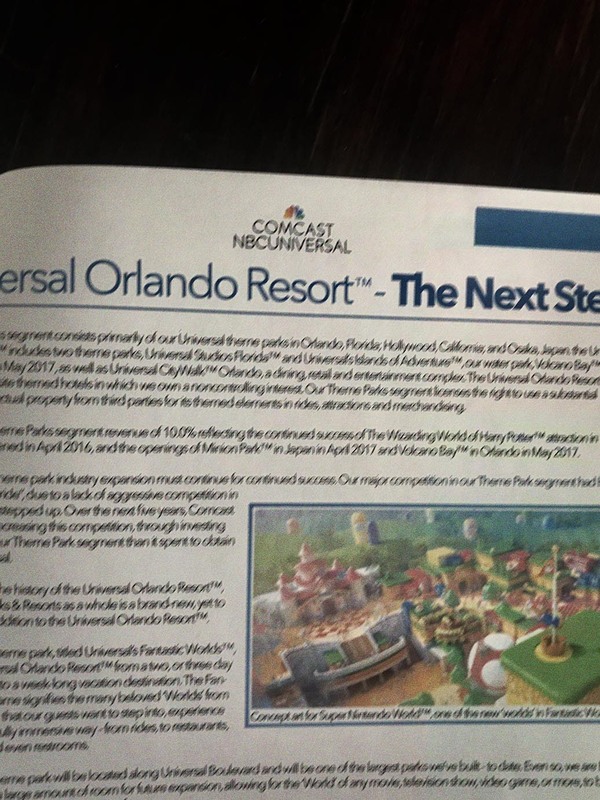 The heading reads: “Universal Orlando Resort – The Next Step” just like the slide from the meeting shown above. I have stitched together 6 different photographs to re-create the page in full as best I can, but some text is missing and a couple paragraphs are blurry. The original photos as they were sent to me can be found below as well. 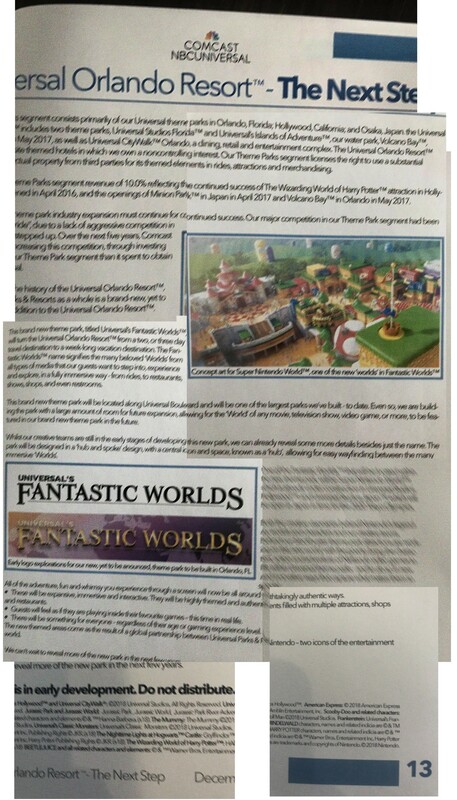 The introductory paragraphs speak broadly about the company’s parks segment around the world. 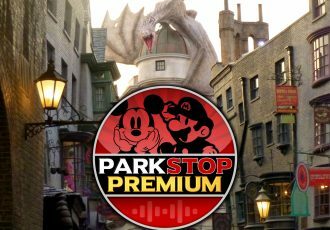 It talks a little about revenue, and the success of the opening of The Wizarding World of Harry Potter in Hollywood, Minions Park in Japan, and Volcano Bay in Orlando. The next paragraph talks about how their major competition (presumably Disney,) had gotten a “free ride” due to a lack of aggressive competition. It says Comcast needs to increase spending in the theme park segment over the next five years, spending more over that time period than it did to obtain NBCUniversal in the first place. This paragraph echoes a lot that was first reported by Robert Niles in Theme Park Insider last month. 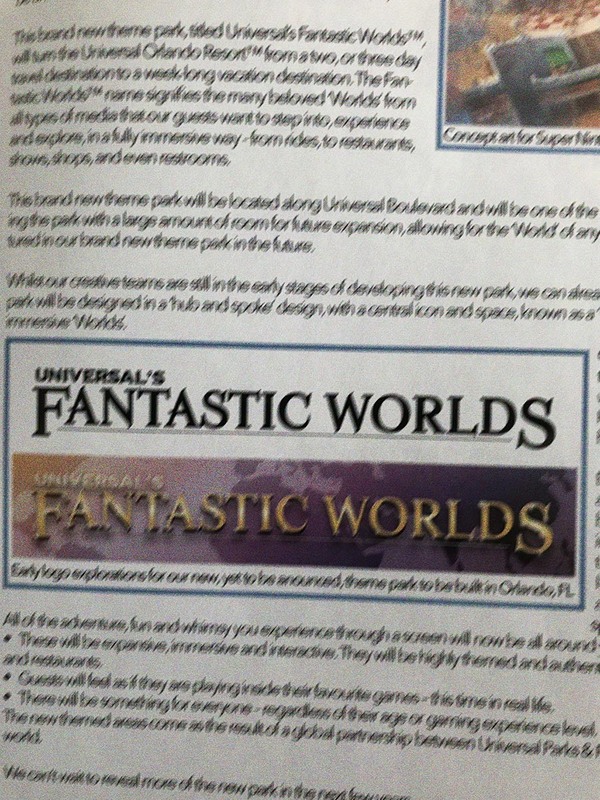 The document then goes on to introduce the Orlando resort’s newest theme park in development, Universal’s Fantastic Worlds. 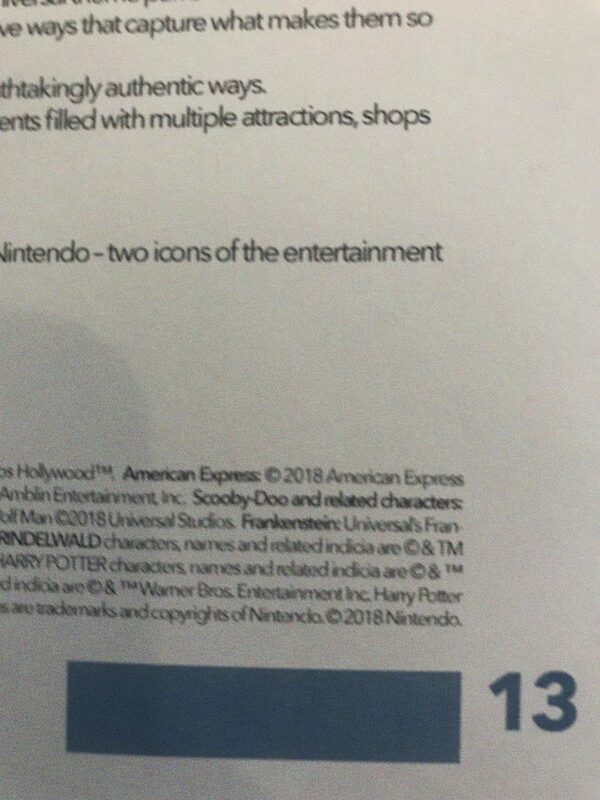 It says “This brand new theme park, titled Universal’s Fantastic Worlds, will turn the Universal Orlando Resort from a two, or three day travel destination to a week-long vacation destination.” This quote is nearly identical to the words spoken by NBCUniversal CEO Steve Burke on a Comcast earnings call back in July of last year. That was the first time anyone from the company acknowledged their efforts to add a new park to Orlando publicly. The document goes on to say “The Fantastic Worlds name signifies the many beloved ‘Worlds’ from all types of media that our guests want to step into, experience and explore, in a fully immersive way – from rides, to restaurants, shows, shops, and even restrooms.” It sounds like the new park will be created as masterfully as The Wizarding World of Harry Potter lands were, right down to bathroom theming, (Moaning Myrtle comes to mind). Unlike the other Universal parks, it sounds like this new park will be built with entire sections of land set aside for expansion. 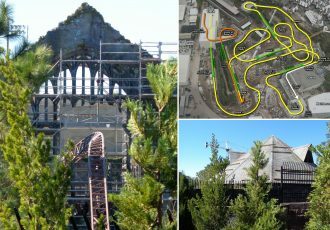 While parks like Islands of Adventure were built with expansion plots large enough for single attractions to be built, like Harry Potter and the Forbidden Journey and Skull Island: Reign of Kong, this sounds like there will be space set aside to add entire lands later on. Rather than retheming an existing land, they would have the flexibility to simply add another one outright. No other Universal park around the world is done in a hub and spoke design, which is a classic theme park layout made famous by the original Disneyland park. 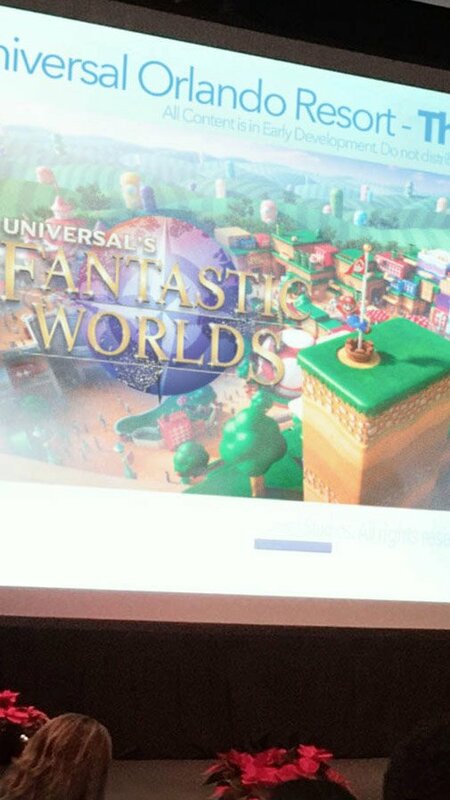 This will not only be a first for Universal, but it may also offer a way for each ‘world’ to be accessible through portals in the center hub. Think Diagon Alley’s brick wall, but for every land in the park! 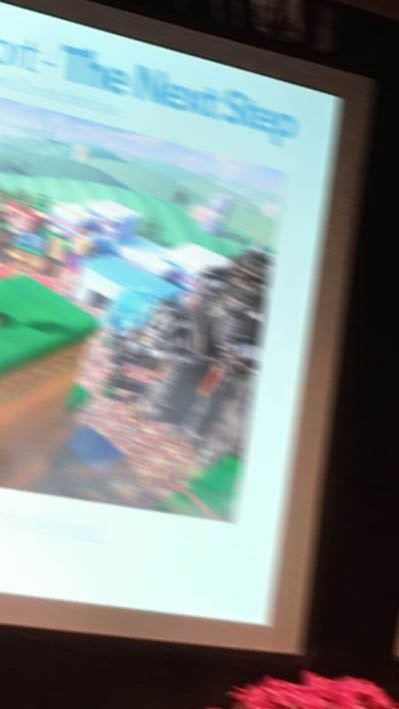 Super Nintendo World, the only world guaranteed to be in the new park, is rumored to be entered through a green warp pipe, so there’s your first portal right there. Portals around a center hub is a popular motif in virtual worlds and MMOs, RPGs, and other video game like environments. 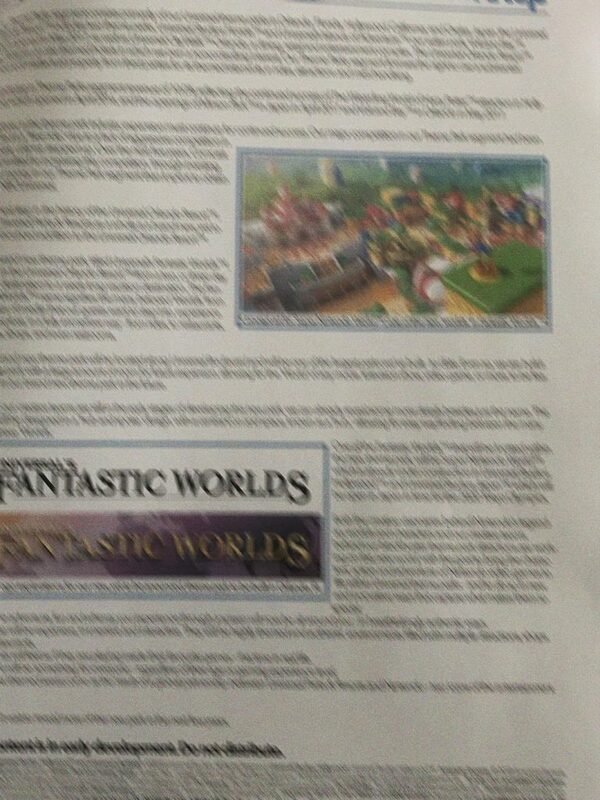 The next couple paragraphs, just to the right of the logo variations, are completely blurred and unreadable. (If anyone wants to take a stab at it, please let me know!) 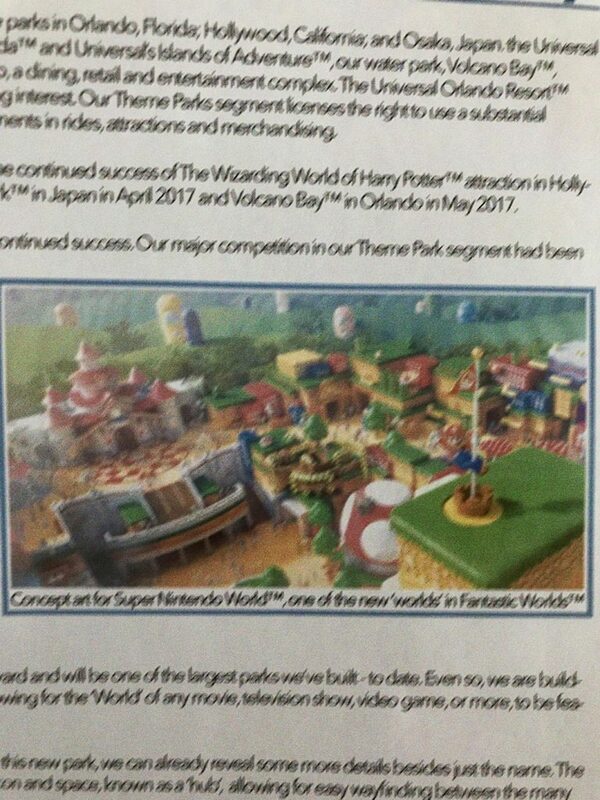 I believe it starts to discuss Super Nintendo World in particular, as the bullet point list below these paragraphs describe details for the land that were announced publicly on the Universal Studios Japan YouTube channel to help promote the first Super Nintendo World being built there. The bullet list describes the land as expansive, immersive and interactive. “Guests will feel as if they are playing inside their favorite games – this time in real life.” “There will be something for everyone – regardless of age or gaming experience level.” And it briefly mentions how the new themed areas will come as a result of a global partnership between Universal Parks & Nintendo – two icons of entertainment. 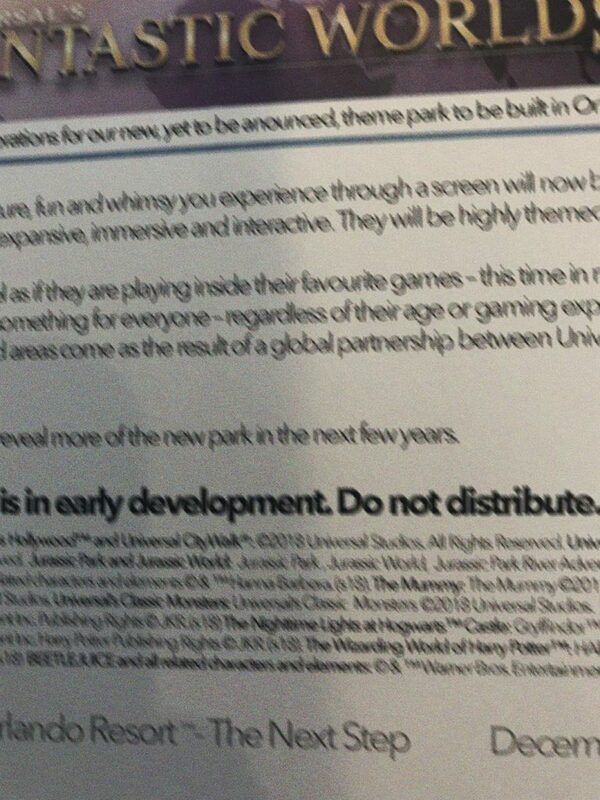 The last line on the page reads: “We can’t wait to reveal more of the new park in the next few years.” And I couldn’t agree more! For more details on this document check out our recent episode of the Park Stop Podcast. To see our guesses for all of the lands and rides we expect to see at the new park, check out episode 3 of the podcast, embedded below. 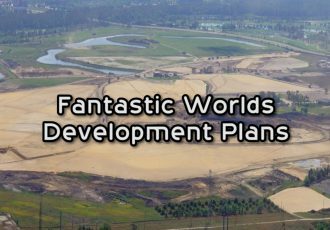 In the episode we also talk about the land development plans that were recently approved by Orange County, and where the new theme park will be located. Please keep in mind that I have no idea if the images displayed here are official, or if they truly did originate from a Comcast town hall. They appear to be genuine as far as I can tell, but I stake no claim on their authenticity. It should be noted that NBCUniversal themselves have not spoken to their authenticity as of the writing of this story. You can see all of the original images below (click for larger size,) or see the combined version above. If you’re going to display these images in an article, video, or other media, please reference this story in your piece. I appreciate it! Interesting that the letter spelled “favorite” the English way “favourite”! This is a lawsuit waiting to happen lol you have to sign several legal documents before even looking at information about the new stuff happening..I’d be really careful about posting something like this. Better hope they don’t find out who anonymously sent them because not only will they get fired but they can face lawsuits. They have teams specifically for looking for people like this online. 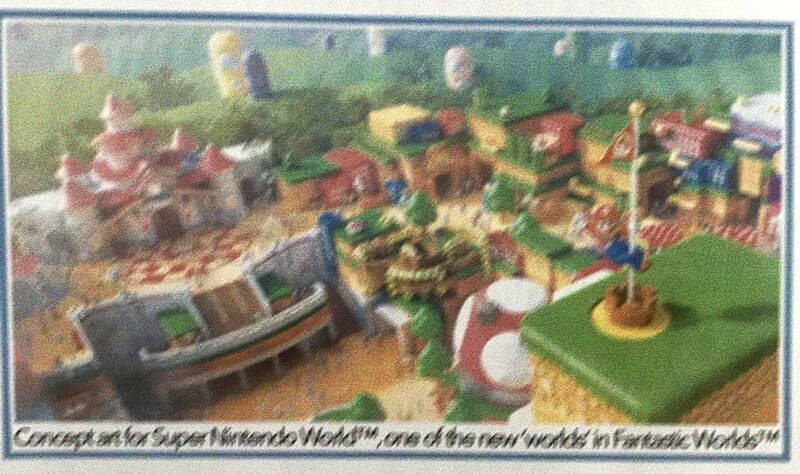 All I wanna know is how long will I have to wait for the awesomeness of Nintendo world?! 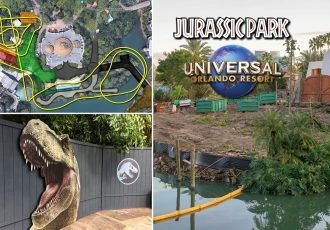 Should be opening next year in Japan, hopefully by 2023 when the new park in Orlando is rumored to open, and sometime in between for Hollywood. 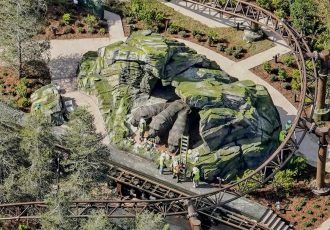 Pingback: Mais novidades sobre o novo parque da Universal em Orlando - Vai pra Disney?